I’m not going to provide any lead in for Ozzy Osbourne, crazy man, media favourite, singer and TV personality, that’s enough really ..., isn't it?! This DVD has actually been out a little while now folks, my bad as this was one that slipped down my items for review during a house clean up and it getting moved. So apologies to my good friends at Kayos who are always on the ball and I was at fault here. This was as many Ozzy fans will know released on video many, many moons ago and when I heard this was coming out on DVD I was interested to snag a copy, more so for Brad Gillis’ inclusion here as replacement for the late Randy Rhoads, taken far too young, than actually Ozzy. Ozzy wasn’t really in the best of shape at this point and perhaps jumped right back into the game a little too soon after being ousted from Black Sabbath, being replaced of course by the late great legendary Ronnie James Dio. This was recorded in 1982 and features a very impressive band, including the previously mentioned Brad Gillis (Night Ranger, Vicious Rumors) on guitar, Rudy Sarzo (Dio, Whitesnake, Quiet Riot) on bass, Tommy Aldridge (Pat Travers, Whitesnake, Thin Lizzy) on Drums and Don Airey (Rainbow, Judas Priest, Deep Purple, Black Sabbath) alongside Ozzy. A big light show ensues, but Ozzy enters from the back of the stage holding a cardboard cross and makes his way to the front and throws it to the ground, with a big bold grin. I really don’t think it was meant as any slant against Christianity to be honest and think it was more in keeping with slamming Black Sabbath, his old band, as they often played gigs with a cross behind them. That’s how I take it anyway! The band erupts into ‘Over The Mountain,’ with a thunderous Tommy Aldridge pounding away on the skins, joined ably by Rudy Sarzo and his resonating bass and pyros galore, in a deep red bathed stage set! Ozzy looking a little pudgy though and seriously possessed, very scary, with eyes lit up like a Christmas tree! Brad Gillis does a phenomenal job in place of the departed Randy Rhoads. The eerie intro to ‘Mr. 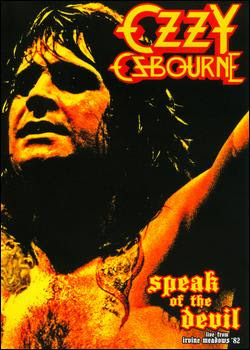 Crowley’ on keyboards, is loud and clear from Don Airey and Ozzy looks a freak and he starts hopping up and down like a frog on stage …. Weird?! Brad Gillis is continually shredding away, killer licks! Of course remembering back to that time, Ozzy was really bitter and twisted about being replaced by Ronnie James Dio and so most people figured the whole dwarf thing was just Ozzy being sore at his old old band mates. Sorry Ozzy, Ronnie may have been a little guy, but he had a huge voice and always a big heart to the fans. Ozzy then says, ‘Let’s go crazy …’ and proceeds to introduce ‘Crazy Train’ and Brad Gillis does not copycat all that Randy did and he really made the song his own here. Loads of the ‘widdly, widdly’ guitar style going on, but quite different to Randy nonetheless impressive though! Next is ‘Revelation (Mother Earth)’ which slows things down a bit and really, Ozzy’s eyes looked so bad, that real possessed look I mentioned earlier and heavy, heavy eye shadow make up and add to that, by this point of the show, his shirt was ripped off and Ozzy is no Charles Atlas and does not look that good. The track features some nice piano work from Don Airey and some seriously, almost Yngwie (Malmsteen) style guitar playing from Brad Gillis. As the track comes to a conclusion, Ozzy introduces next track, ‘Steal-away (The Night)’ and it rocks like a trooper! The pyro show continues, as well as an impressive laser light show, which was of course all the rage in the early 80’s. I know that since this period of time, both Ozzy and Sharon Osbourne have now admitted that Ozzy was in a really bad way at this time in his career and sadly, it really does show. Next is Brad’s guitar solo, before he is joined by other band members for a big old instrumental jam which showcases a lot of the styling’s he developed thereafter in Night Ranger. Great player! This jam then leads into Tommy Aldridge’s massive drum solo, before we see the dwarf guy getting strung up for a public hanging, as the band comes back to join in again. As they launch into ‘Flying High Again,’ Rudy Sarzo has established this pose he keeps assuming where with legs stretched out apart, he throws his massive long head of hair, back and forth and back and forth, so aggressively that it’s astonishing that he hasn’t endured whiplash at the end of each show, seriously! Cue the Black Sabbath classic, which Brad Gillis leads everyone into with the classic riff. Then it’s another from the Sabbath era with ‘Children of the Grave,’ which closes the set and they leave the stage, only to return for the expected ‘Paranoid,’ with Ozzy coming out under the drum riser, through the dry ice, as a huge hydraulic door opens in drawbridge style up. The Sabbath classic sounds a little strange, as the keyboards are very, very prominent. Rudy continues to lash his hair, back and forth and as they finish the track to a flurry of pyro’s, Ozzy shouts out, ‘Goodnight, we love you all' and instantly up come the credits. Ozzy has always managed to pull onboard some phenomenal players and with this performance, it’s no different. I guess I just feel kind of sorry for the guy that when he did this, with some great material, that he wasn’t in better shape. I don’t really know how much this show was tweaked; before this current release but it’s a shame the imagery wasn’t better, clearer, especially in today’s HD world. Perhaps for Ozzy purists only or Brad Gillis fans who had not seen this chapter of the man’s career?